Get charged up with this Warcraft Lothar Statue Phone Charging Dock! Designed from the film Warcraft, this charging dock features the Lion of Azeroth ready to attack with his signature sword. Intricately sculpted and carefully painted, this charging dock can also be displayed as stunning statue. 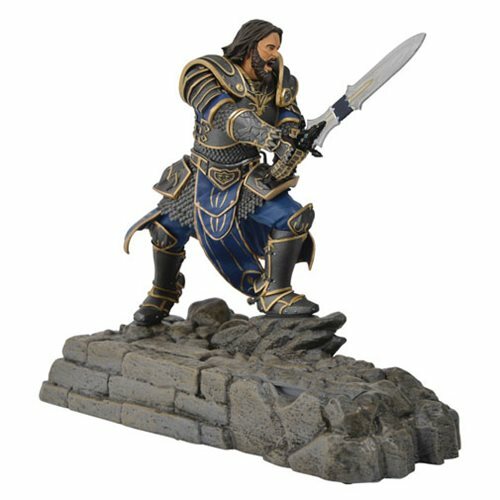 Pair this knight with the Durotan Charging Dock for an epic battle scene (sold separately)! This Warcraft Lothar Statue Phone Charging Dock fit phone sizes up to Galaxy S6 edge+ and iPhone 6S Plus and comes with a universal cord that fits most Micro USB and Apple Lightning cable plug sizes. Measures about 11-inches tall x 9-inches long. Ages 13 and up.